One of my first Roksanda Ilinic shows was when she exhibited at 'Fashion in Motion' at the Victoria and Albert Museum. Roksanda presented a special collection and featured a selection of pieces from previous seasons. Roksanda's distinct style of contrasting soft draping with strong structural details, inspired by her studying of architecture, was interspersed with the addition of pleating and gathering and appliqué detailing. These characteristics are still visable within her current collections, although this season Roksanda illustrated two further skills, an astute use of bold colour and the ability to create covetable geometric prints, with the example of her 'glass shard print' which she paired with a canary yellow structured, neoprene and wool-crepe, midi skirt at her SS14 show. 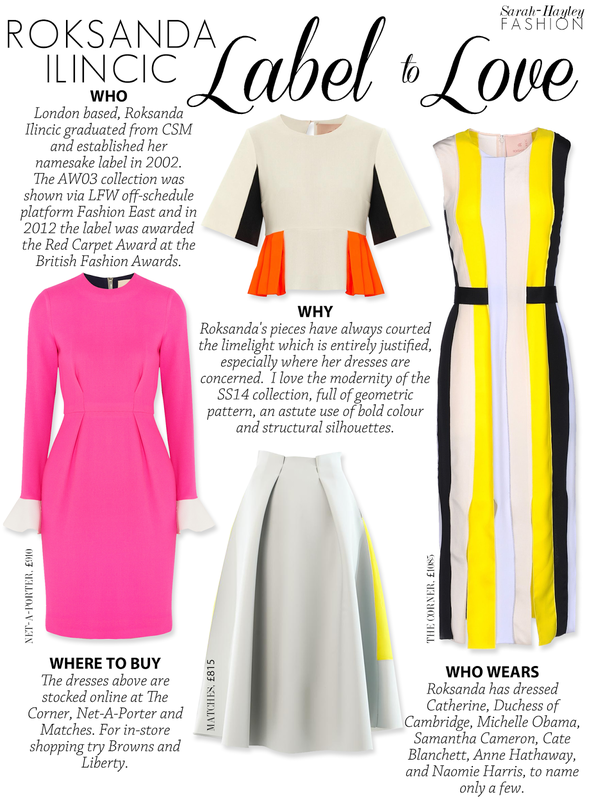 Roksanda's collections are the epitome of effortless elegance, a quality only few can master in contemporary fashion.